Now I`m going to show you one simple example of WP UniParser usage. Firstly enter your blog admin panel, then go to Settings and click on WPUniParser tab. Wait for the dialog asking about unprocessed pages processing continuation. Click OK. The next pass is starting. Parsing process is going on. The number of pages to parse per pass is set in the corresponding field. IMPORTANT: note, that number of pages processed per pass can differ from the number of posts added to the blog during the pass, because some pages can be excluded because of the user defined restrictions (will be described later in this FAQ). 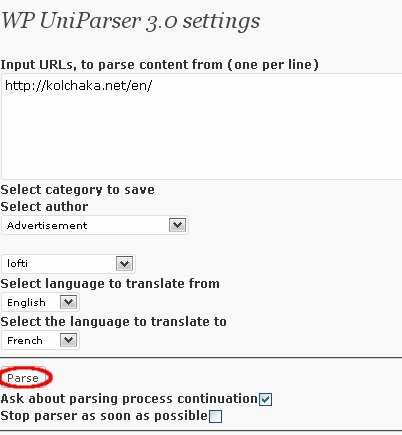 In this way parser will be working till the moment, when all pages, which was added to the processing queue, are to be processed. If you don`t want to answer to parsing continuation question between passes, just take of the checkbox «Ask about parsing process continuation». At last the parsing process is finished. You can see that settings field became active. Now you can scroll down to see parser logs. Pages to process (log includes 200 maximum) (pages to process URLs). Now we see that there are no pages to process URLs in the log. The reason is that WP UniParser already processed all the website pages, which was fitting user defined restrictions, and at the moment unprocessed pages queue us empty. Now we can also check the results of parsing process. On the homepage of our blog we can find new 5 posts (according to the «Number of posts to publish immediately» field). Then get back to the admin panel to Posts->Edit section. Here we can see that overall number of posts is also 5. This happened because at the moment english version of kolchakA.net includes just 5 posts. But if there would be more posts they would be also parsed and scheduled for future publishing with 15 minutes interval following «New posts publication interval (min)» field.